Will a P1 licence be suspended for any speeding offence? Will a P1 licence be suspended for any speeding offence? A. Only for 10 km/h or more over the speed limit. Correct. Any speeding offence when you are on a P1 provisional licence will result in your licence being suspended. When you are learning to drive it's best to get instruction from a qualified driving instructor rather than just your friends or relatives. This is because many people crash within the first few years of driving, until they've built up enough skills. Build up your skills on quiet roads in daylight, then progress to busier traffic and motorways as you gain confidence. When you go to take your licence you must not offer or pay a bribe to a testing officer, and you must not cheat on the test. There are severe penalties if you are caught doing this. You must carry your drivers licence with you at all times when you drive. If you are stopped by the police and you do not have your licence on you, you will be given an on-the-spot fine or summonsed to court. A police office might check that you are correctly licenced if you are stopped for random breath testing. There is a graduated licencing scheme whereby a driver or rider starts as a learner, then progresses through P1 and P2 and onto a full licence. The restrictions get less as the licencee progresses through the process. 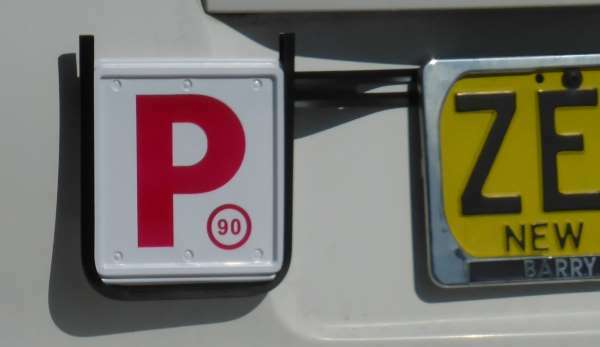 L or P plates must be displayed on the front and back of the exterior of the vehicle with all of the letter visible. A provisional P1 or P2 driver cannot legally instruct or supervise a learner driver. P1 and P2 drivers are not yet experienced enough behind the wheel. To take the driving test for a P1 licence you must be at least 17 years old, have logged at least 120 hours of driving time (including at least 20 hours at night), and have held your licence for at least 12 months. You have to hold a P1 licence for at least 12 months before you can attempt the Hazard Perception Test in order to proceed to your P2 licence. A P2 licence must be held a minimum of 24 months before a full licence can be issued. P1 drivers are not eligible to hold heavy vehicle licences of any kind; P2 drivers are not eligible for an HC licence. Provisional P2 licence holders (who also hold a Class LR, MR or HR heavy vehicle licence) will remain on a provisional licence until they have held the P2 licence for a minimum of two years and passed a Driver Qualification Test. The blood alcohol level for learner or provisional licence holders is zero - this means you must not drink any alcohol at all before driving or riding. A P1 licence will be suspended for three months for any speeding offence. You can drive a van with seats for up to 11 passengers on a car licence, plus a vehicle of no more than 4.5 tonnes GVM (gross vehicle mass), any tractor implement or a car-based motor tricycle. You must be at least 16 years and 9 months old to obtain a learner motorbike licence. You don't have to hold an alternative driver's licence to get a motorbike licence. Motorbike riders start with pre-learner training which is 7 hours over 2 sessions, then they take a rider knowledge test (you can practice yours on this site). If they pass the test they get a learner rider licence which must be held for a minimum of 3 months and is valid for 12 months. During this time there is pre-provisional training (a 6-hour course), then a motorcycle riding test to get the P1 licence. The P1 licence must be held for a minimum of 12 months and is valid for 18 months. The rider progresses to a P2 licence which must be held for a minimum of 24 months and is valid for 30 months. Finally the full licence is issued for 1 year, 3 years or 5 years. You are not allowed to tow a trailer or carry a passenger until you have your P2 licence. Rider's must ride an approved motorbike - find out more here about LAM-approved motorbikes. Passing your pre-learner training on an automatic motorbike means you will only be able to ride automatic motorbikes in the future. The speed limit for learner and P1 riders is 90kph, and 100kph for P2 riders. You can ride a motor tricycle on a motorbike licence. There are several types of heavy vehicle licence that allow you to drive different classes of vehicles. Any supervisor or instructor must have held a licence in the class you are driving for at least one year or more. The GVM must not exceed 8 tonnes and any towed trailer must not weigh greater than 9 tonnes GVM. The must have two axles. The number of passengers can be 12 adults or more, including the driver. The vehicle must be rigid, i.e. not articulated. A driver must have held a class C licence (except a learner licence) or equivalent for more than one year, pass a knowledge test (practice it on this site by choosing a test in the menu above), pass an eyesight test, and either pass a Roads and Maritime driving test or undertake HVCBA (Heavy Vehicle Competency-Based Assessment). A medium rigid licence allows you to drive a vehicle greater than 8 tonnes, but any towed trailer must not weigh greater than 9 tonnes GVM. All other restrictions are the same as the LR class licence. The vehicle can have three or more axles. Bendi-buses are treated as rigid vehicles. The minimum test vehicle for a HR driving test or HVCBA is a three-axle rigid vehicle with a GVM or more than 15 tonnes, excluding bobtail prime mover. All other restrictions are the same as for LR and MR.
Any towed trailer with a GVM of more than 9 tonnes. The driver must have held a class MR or HR licence or equivalent for at least one year. The minimum test vehicle is a three-axle prime mover with a minimum two-axle semi-trailer or a heavy rigid vehicle plus trailer over nine tonnes GVM. All other restrictions are as per the HR class licence. The driver must have held an HR or HC class licence or equivalent for one year or more. The driver must pass a medical exam. All other restrictions are the same as for the HC class licence. Medical exams must be taken at aged 21 then every 10 years; at age 40 then every 5 years; at age 60 then every two years; at age 70 then annually. You can be convicted and fined or sentenced for a range of driving offences such as driving with excess breath alcohol, dangerous driving, having a radar detector in your car for any reason and so on. For many of the more serious offences you will lose your licence, will receive a hefty fine and could be sent to prison. If the police stop you on suspicion of illegal drag racing on the road they may take immediate action by impounding your vehicle for up to three months. You will get three demerit points and a large fine. If you are convicted a second time for illegal street racing then your vehicle may be taken away and sold. More information on illegal street racing is here. If you are caught speeding then you will receive a speeding fine and demerit points.